1967 Chevy Camaro Photo Picture Classic Cars for sale & Classifieds - Buy Sell Classic Car & Classic Truck Classifieds. 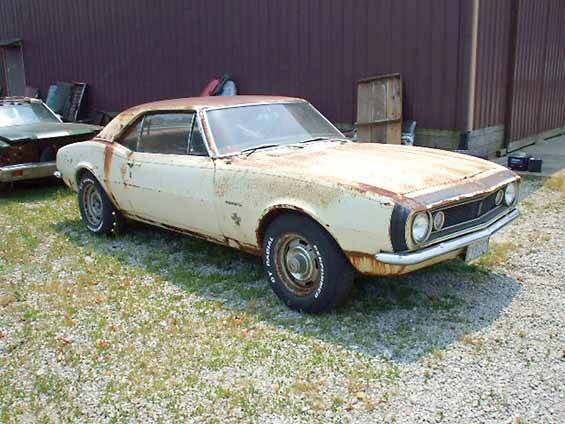 Jason found this 1967 Camaro in Ohio. Luckily it's now rescued and undergoing a full (sub)frame off restoration. I wish I can find one like this! Hi guys yep they are all unibody. The front sub frame can be mechanically detached the rest is all a part of the car. I did just find out that they now make a complete floor boards frrm the pedals all the way back trunk with the rear frame rails included for 1900 bucks for 1st gen Camaros and 'Birds! I was extatic! See TAMRAZ's Auto Parts for more details! I am not a dealer just a Camaro Loving guy who is always looking and finding out stuff! Have a great weekend! Its not a lil 6 banger. It is a 327. Nice lil 6 banger with surface rust........I'll take it!! (turbo) To be honest the only thing missing was one beauty rim. I was given 4 but one was the wrong size. IMO it was an excellent find. The car is currenty in 2 totes and scattered around the garage. The tub and salvageable body panels are going to the strippers on Monday so she is on her way back to her glory days of 1967... I will post more as I get more done. Looks like shes all there, Treat her good. Lol....I'm well aware of what a subframe is...but I didnt think they were all subframed.....are You saying every year was....? sub frame....? and whats sitting behind it.....? (panelguy) Camaros are unibody, meaning it only has a front subframe which stops under the front seats. The frame in the rear is attached part of the the tub so it can not be removed. It is technically not possible to do a frame off restoration on a Camaro. As for the car behind I think it was a Malibu (or Chevelle). I didn't take much notice when I bought the Camaro. Nothing warms a car nut's heart more than seeing a classic ride like this Camaro getting a new lease on life. this looks like it will make a fine ride.little compound&polish will do wonders. i actually have the wheels that came off my 68 in the shop somewhere.